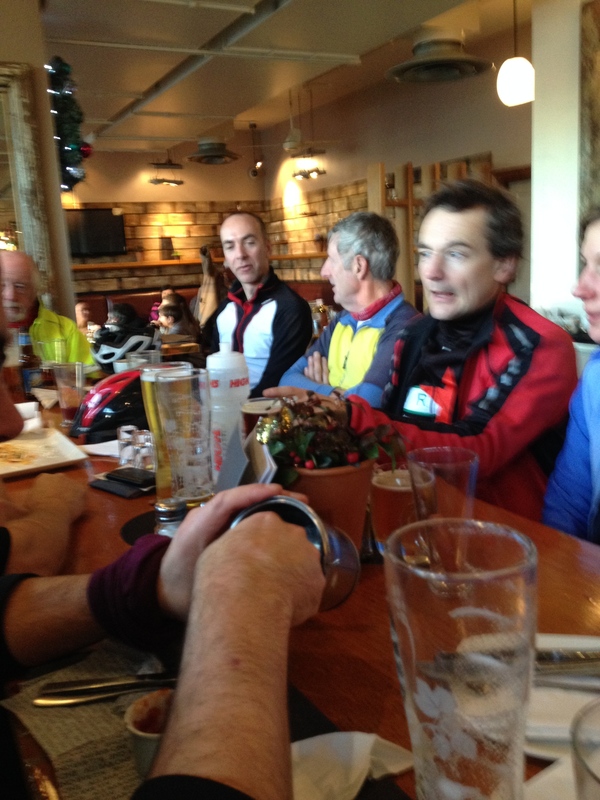 On Sunday 29th December I joined The Fridays‘ annual Xmas/New Year Day Ride. 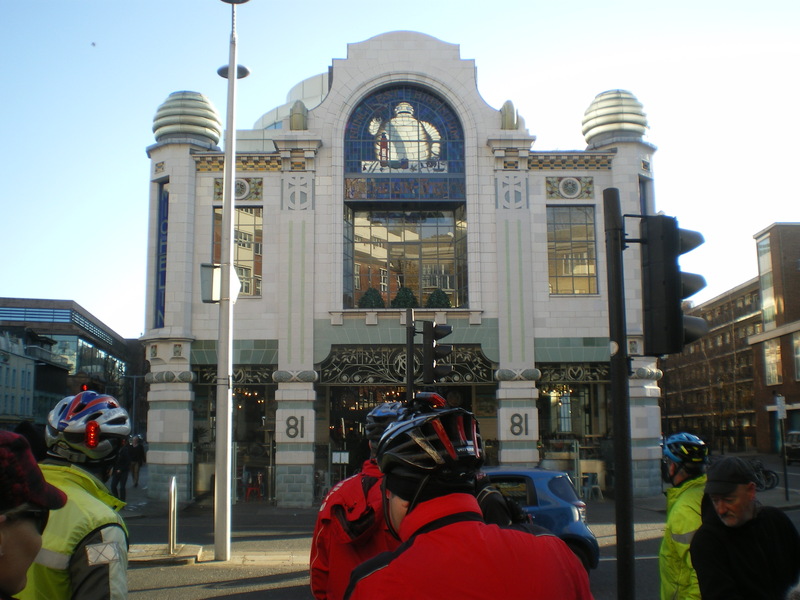 This year’s ride was christened the London Tourette by Simon, the Fridays’ leader, and was a ride around the city’s best architecture. We started, as usual, at Hyde Park Corner and finished, as usual, at All Bar One, Shad Thames. 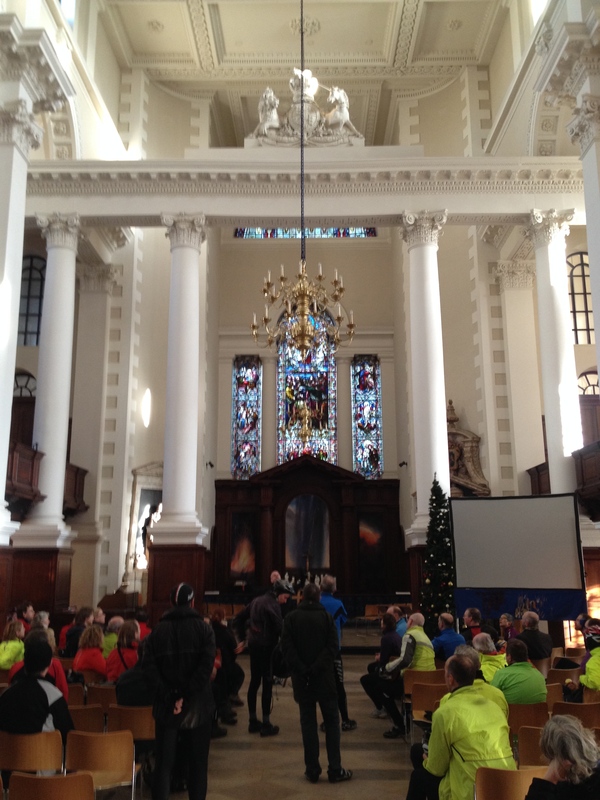 On the way we made eight stops and Simon, himself an architect, gave a personal account of his choices. Getting to Hyde Park Corner by 10.30 a.m. by public transport from Northampton was not easy on the Sunday between Christmas and New Year. No trains were running south of Watford Junction but a bus replacement service was promised for the final part of the journey. I left home on my Brompton folding bike in the dark on the frostiest morning of the winter so far. From Kingsthorpe onwards the roads were clearer but became frosty again on approaching the station. No mishaps and I caught the 0753 service. The ticket collector announced that the promised bus replacement was cancelled but that passengers could use the London Overground from Watford Junction instead. The train arrived late and missed the Overground connection but a replacement coach was offered. This turned out to be an “express” service in that it didn’t stop at Harrow & Wealdstone! 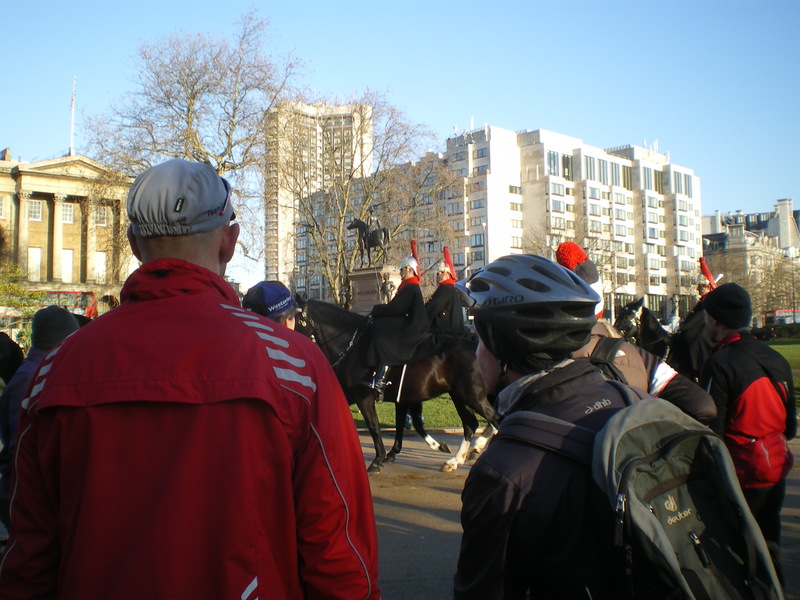 It reached Euston just before 10.00 a.m.
Three miles of quick pedalling along a direct route (quiet on this Sunday morning) meant that I was one of the earliest to arrive at Hyde Park Corner. By 10.30 a.m. we were ready to go – and the Tourette proved to be well worth the effort. 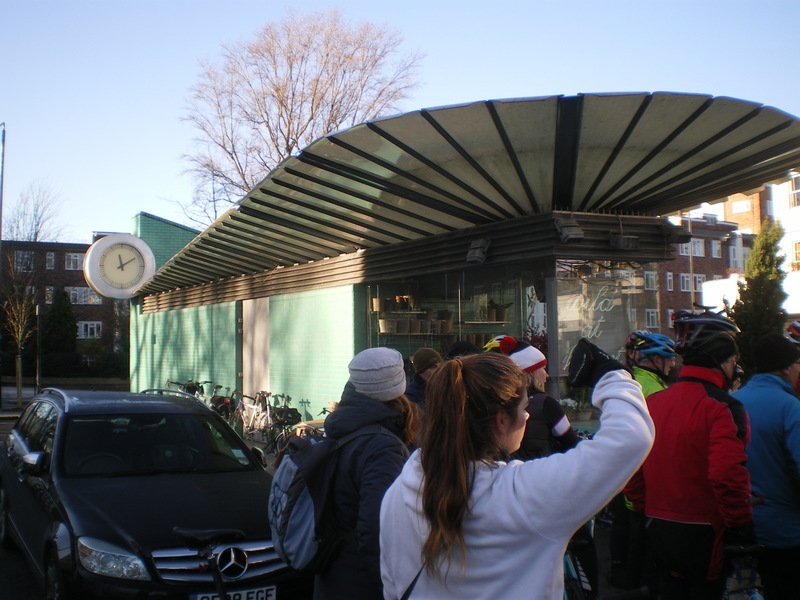 Our first stop was at these remarkable public lavatories (unfortunately closed on Sundays). Local residents took the initiative of commissioning this design as an alternative to Kensington & Chelsea Council’s own mediocre proposal. An area of triangular paving was reclaimed from the centre of two diverging roads and furnished with benches and trees. The plan of the building echoes the triangular site with the lavatories at the wide end. The plinth at the sharp end is partially enclosed by glass to form the florist’s kiosk. Gough is an architect in the CZWG practice. This building – which looks to me as if it really belongs in a medieval town centre in Germany or Austria – is opposite the Royal Albert Hall on the west. 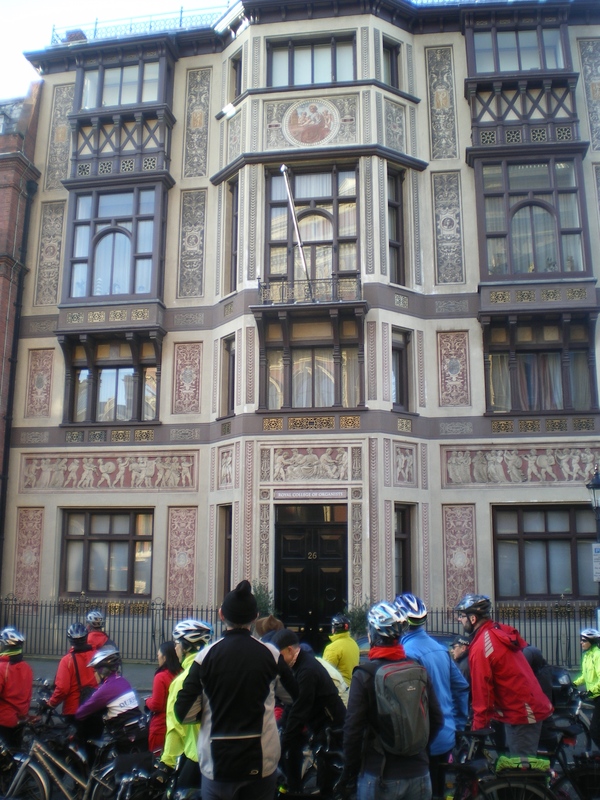 It was the original home of the Royal National Training School for Music, now the Royal College of Music. 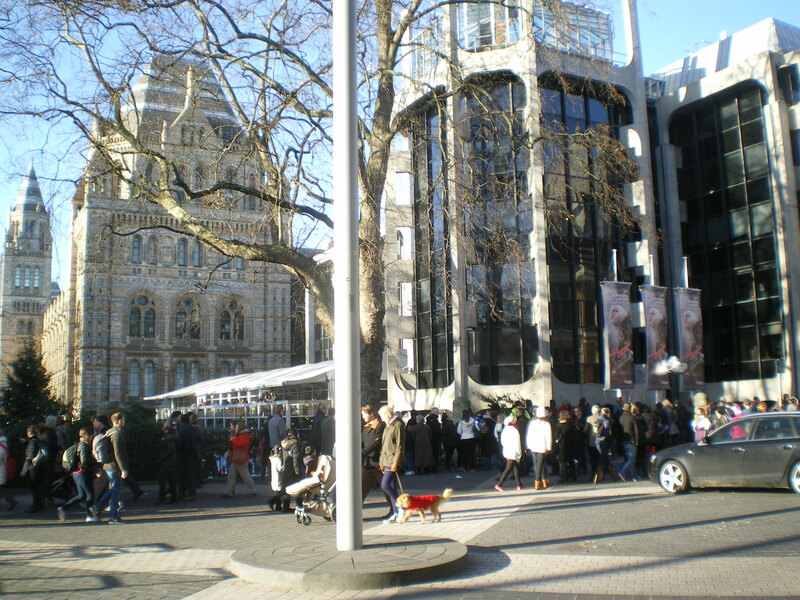 Waterhouse’s museum was a very modern building in the 1870s: an iron frame on which rest terracotta tiles, so much more interesting than the stodgy V & A next door. The shared space controversy seems to have died down a bit. Taxi drivers make life interesting. 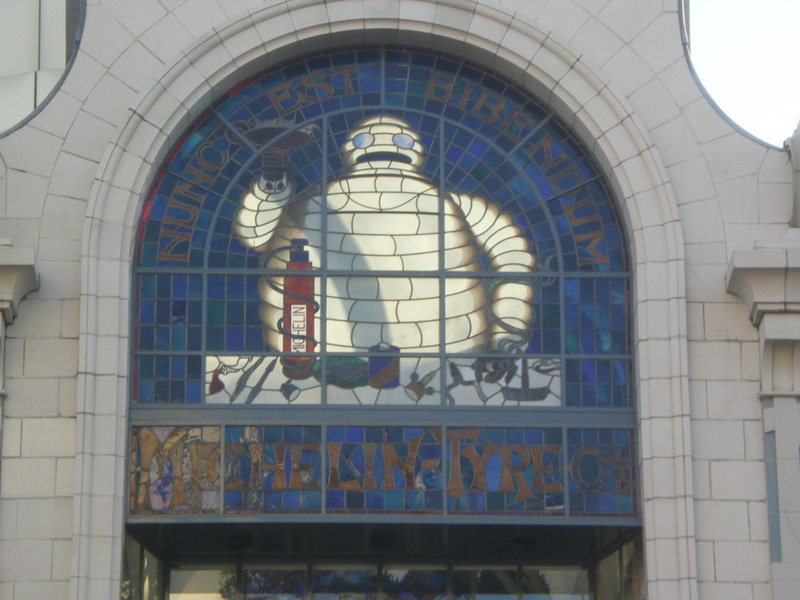 Notice how the original Bibendum (or Michelin Man) was made of cycle tyres and had a pince-nez for eyes. 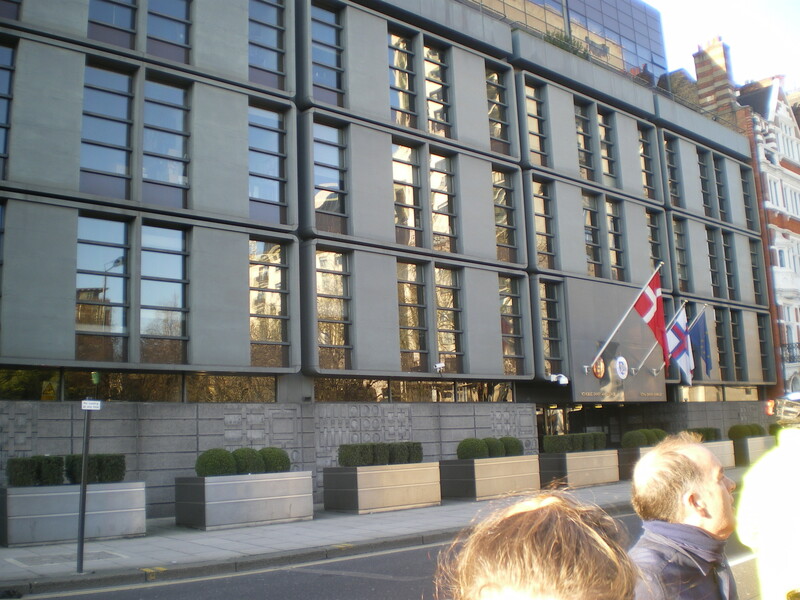 Designed by the late great Arne Jacobsen this modern embassy is shared by Iceland too. 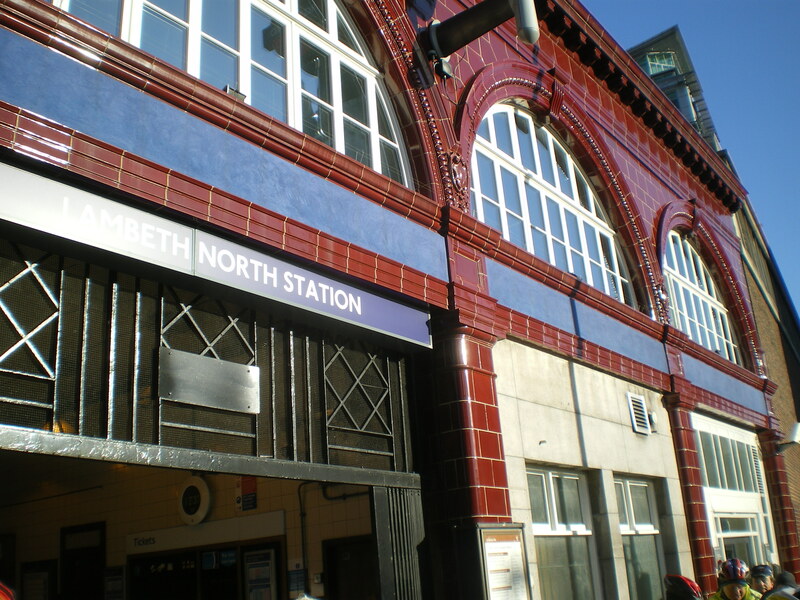 Leslie Green designed over thirty London Underground stations in five or six years after 1900. They have iron frames covered in ox-blood-red tiled façade and the semi-circular windows of the first storey – arches in all but name – indicated straightforwardly to the Victorians and Edwardians that these were railway stations! The arch serves no purpose at this level – but railways meant arches! The tiles were resistant to London soot. Opposite this station is a church – a Congregationalist chapel – with an interesting historical connection. Erected on the centenary of the United States Declaration of Independence, the driving force behind it was Christopher Newman Hall. 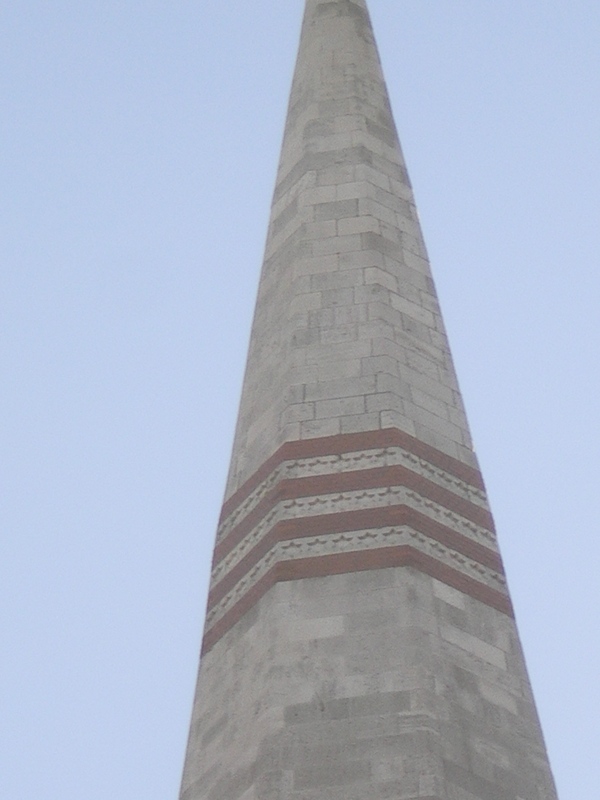 He had lectured extensively in support of the abolition of slavery during the American Civil War and afterwards he raised funds for the tower as a London memorial to President Lincoln. The highlight of the tour! 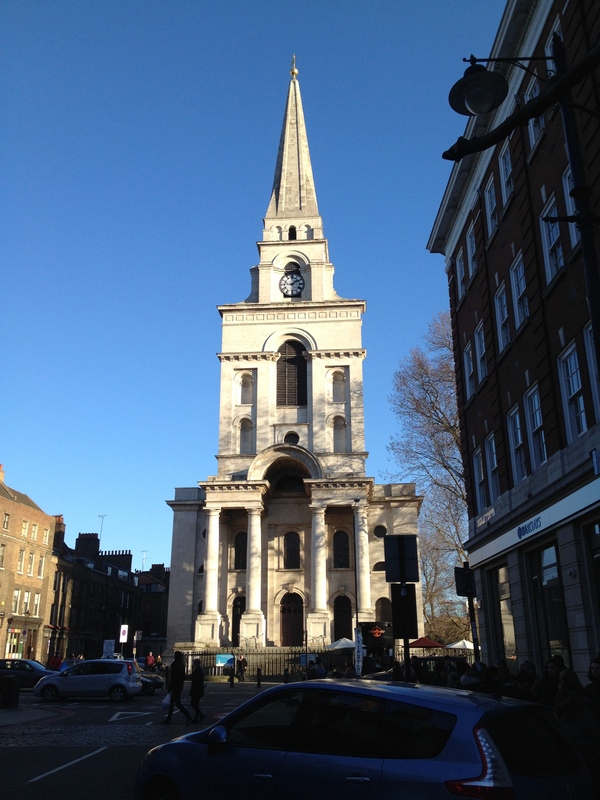 Christ Church Spitalfields makes it into Jenkins’ hundred best churches in his 1999 book “England’s Thousand Best Churches”. Then – fourteen years ago – he noted that the restoration was far from complete: “the ceiling seems to rest … on gloom and dust”. 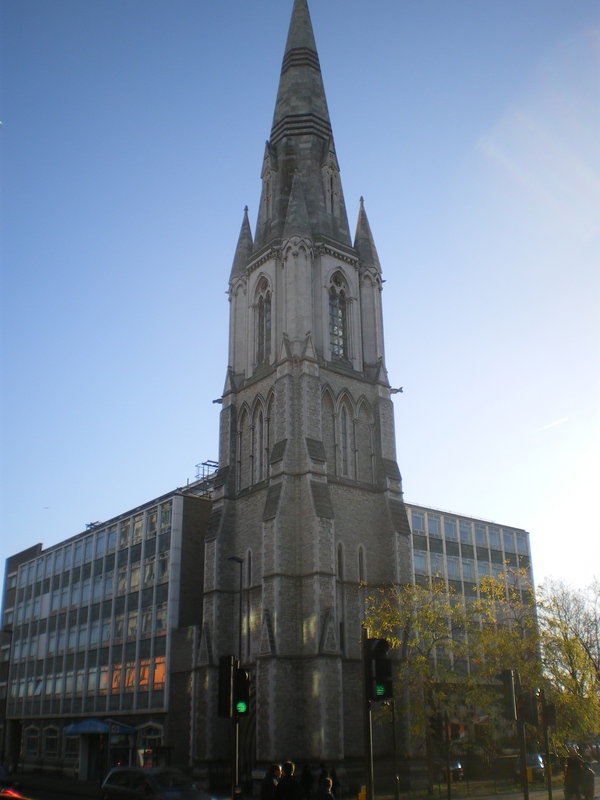 In 1970 the church was near to collapse but Jenkins was able to describe it as “London Baroque at its most self-confident” although he does quote Pevsner’s view that it “could not be called anything but ugly”. A delightful final stop. Domestic house and offices by FAT, the practice that has just announced that it is calling it quits. 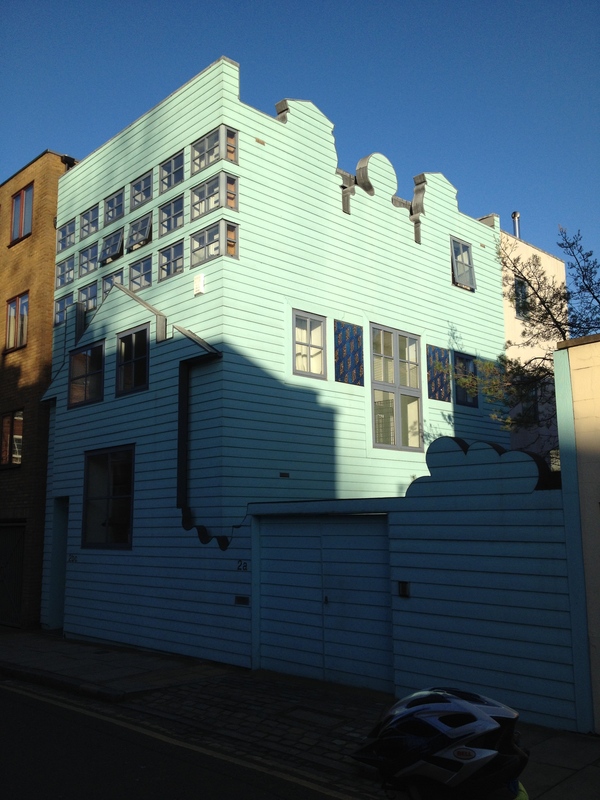 We see the cut-out form of a diminutive pitched-roof house, stuck on to a cartoon office block. “Adolf Loos on the inside, South Park on the outside,” as Griffiths put it. Ten minutes riding from Hackney, across Tower Bridge, and we were at Shad Thames where Simon had reserved tables for the group. Much beer was drunk, food was eaten, conversations had, and plans made. Old friends who had not made the ride were welcomed on arrival. Like the whole day, a good time was had by all! So much easier than getting from home! A straightforward bit of pedalling from Tower Bridge to Euston station, a train to Northampton, and a final pedal saw me home by mid-evening. My route for the day in London (starting and finishing at Euston station) is here on Ride with GPS. My friend Els had an interesting account of the day here on her blog with additional pictures, often lovely little asides, here on Picasa.